THIS is the world's most expensive bag! | HELLO! If you've ever wondered what the world's most expensive handbag looks like, then wonder no more. 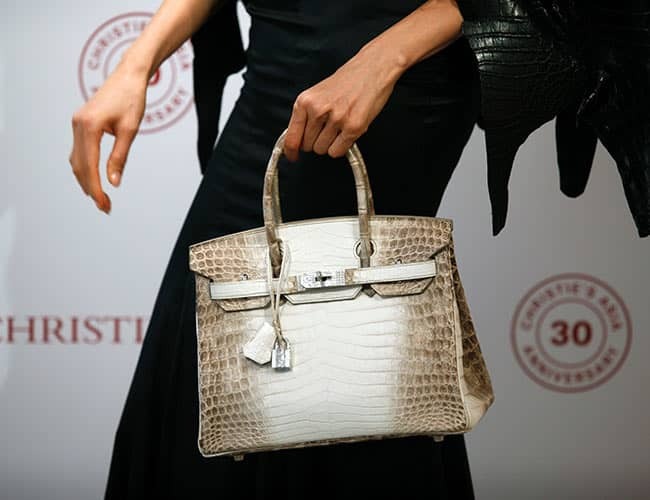 An extremely rare Hermes Birkin bag was recently sold at auction – for more than £207,000. The Diamond Himalaya Niloticus crocodile Birkin is adorned with real diamonds and 18ct white gold, according to Christie's Auctions, who sold the bag for a private collector. A press release read: "The diamond pieces created by Hermes are exceptional, but none are nearly as iconic as the Himalaya. It is believed that only one or two of the Diamond Himalayas are produced each year, globally, making it one of the lowest production runs for handbags." The gorgeous bag was produced in 2008 and sold to its former owner a year later. The previous record for the world's most expensive bag ever sold was another Birkin, a fuchsia creation decorated with diamonds, which went for more than £150,000. But if you have the world's most expensive bag, you're going to need a pair of equally as pricey shoes – right? Last year it was claimed the heels that will set you back the most are Stuart Weitzman's 30ct Diamond Dream shoes. Would you ever spend that much on fashion? Let us know in the comments box below.